This set consists of 4 handpainted Urban terrain Tiles. These 30cm x 30cm (1'x1') Tiles connect magnetically and can be configured to create any Urban board. They come in 3 distinct themes: "Rustic", "Medieval" and "Modern" which cover a wide range of Urban environments and gaming themes. You can arrange them to simulate many different street layouts to fit any size of playing area, to suit each of your games. And, since they take up minimal space, you can store them in a small living-room cupboard. This is one of the Base Sets. You have to pre-order a Base Set before adding any more tiles and/or base sets in your order. Not in stock - this is the pre-order the Pedion "Village" 2'x2' Urban Battlefield Set; this is the equivalent of the same Kickstarter Reward level, to be delivered in April 2018. Great for Skirmish, Age of Sigmar, Kings of War, Frostgrave, Bolt Action, Flames of War, Warhammer 40K and Runewars wargames, as well as Dungeons & Dragons and other role playing game sessions. Miniatures and buildings shown for Scale purposes only. "Magnetised" the tiles slightly increases the thickness by 0.3mm. It is barely noticeable next to regular tiles and it won't affect either terrain placement or aesthetics. However, before upgrading your tiles you should consider the weight increase as some of the tiles may double in weight. Why upgrade your tiles this way? We already have many magnetically based terrain pieces, and we are planning a full line of magnetic accessories, including Trees with city pavement bases, City Lights (both old-fashioned and modern), Traffic lights, Flower beds, Wire Fences, Stone walls (like the ones you are getting as a gift! ), Town hedges and many more. Check the Magnetised Urban Terrain Scenics for options! If you play many games of Frostgrave (the excellent Skirmish game), or if you just enjoy the coolness of the Frozen City look, then this new Upgrade is for you: you can update any (or all) of the tiles in your Medieval Set to look weather-beaten from snow storms. This option is available only for Medieval themed Urban Tiles. We treat the tiles with flock and resin, so that they get a white dusting, snow drifts and frozen ice pools on the streets. Please note that the Frozen City treatment is not removable - it will change the look of your medieval tiles permanently. Check the Gallery images for how this Option upgrades your tiles. You have the option of adding extra, scale-specific roadlines on your "modern" themed roads. For ease of play and less scale dependency, "modern" themed roads come only with white sidelines painted on them. You can order your road tiles at 14cm width instead of the standard 7cm width. This is something many people gaming exclusively in 28mm scale have asked for, a road width closer to real modern day roads. This option is available only for "Modern" themed tiles and reward sets, i.e. to asphalt roads. A road width of 14cm corresponds to a double-lane street (real world width of approximately 7.85 meters or 24 feet). There is no extra charge involved with this option: you will simply state whether you like your "Modern" themed tiles in 7cm or 14 cm width. Keep in mind though that it would be wise to add some extra road lines (see above) to properly delimit the two lanes. This option allows you to add Transparent 1" Square Grid Sheets on top of your tiles. You can lay these sheets over the tiles you want to measure based on a grid, play your favorite RPGs, Frostgrave or Deadzone, and then remove them just as easily. Check the Gallery images for how this Option upgrades your tiles. This option does not offer you a new tile design per se, but lets you alter the appearance of any (or all) of the tiles you have selected. The tile will "acquire" 2 different sized artillery craters and debris. This appearance Upgrade can be applied to any tile design and all Themes. Keep in mind of course that it reduces available space to place buildings etc. The 2 craters will be of varying size, cast from resin. Check the Gallery images for how this Option upgrades your tiles. Find more info on the project and the Reward at our Urban Kickstarter page; Kickstarter fulfilment delivery is set for April 2018.
allow the gamer to quickly recreate street networks and the chaotic fabric of an urban environment in multiple configurations, different for each game. look beautiful and authentic but at the same time be practical for gaming. 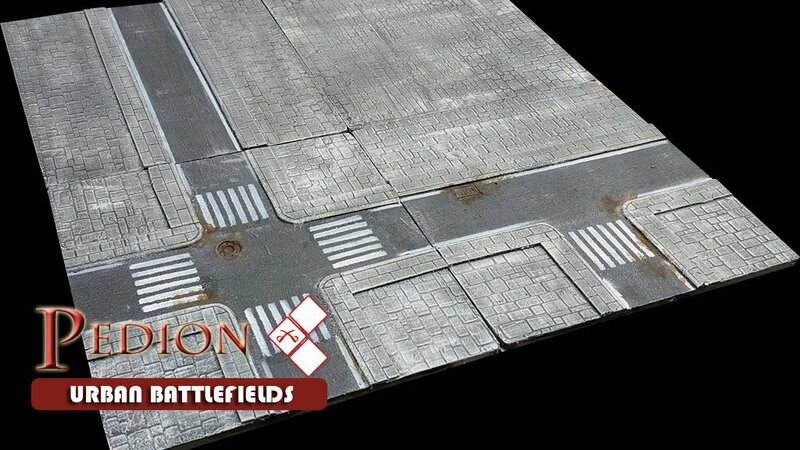 work with other Pedion Battlefields tiles. enable the placement of buildings, fences and scenic terrain pieces details from any manufacturer, without stealing the spotlight. adhere to all Pedion design parameters: full modularity, simple connectivity, thin, lightweight, durable, easily stored. The Urban tiles will be made from Polystyrene based on PVC sheets, with magnetic corners to attach to each other. Trying to encompass the look and feel of every urban corner in every era and genre is impossible. Even more, Pedion tiles are intended for gaming, not for dioramas, however good they may look! So from all the options, we decided on three (3) generalised urban terrain Themes. We believe they will cover multiple periods and that the buildings and scenery placed on them will do the job of specialising the board's purpose, be it a historical or fantasy setting. RUSTIC: The first theme will combine classic cobblestone roads with a 'dirt'/soil texture on non-paved areas, these spaces being reserved for buildings. The soil texture is enhanced with patches of green vegetation and there are extensive grass tufts on the road sides where the water usually collects. Intended to be neutral to suit any geographic location, the dirt colouration is completely new to our tiles. The style works quite well on any Urban/suburban environment where the people may have used cobbles to pave some of their streets. It fits Rustic settlements, rural areas, villages, small Towns, even ancient cities if the residing civilization used stone on roads. By leaving open spaces in-between the houses, one can create smaller alleys and dirt paths branching away from the main cobblestone roads. There are no signs of a drainage system, so that the Style can be used in areas and eras where an underground one would not exist. MEDIEVAL: Perhaps the most flexible theme, it can be used in many Wargame or RPG scenarios. This theme uses two different cobblestone patterns; a smaller recessed one for the roads and a larger embossed one for the building spaces. There is an irregularly shaped string of stones on roadsides to act as a primitive sidewalk and there are drainage grates implying the existence of basic sewers. There will be an option for each backer to include sewers and manholes or not. This theme can be used to represent the basis of multiple urban environments, especially medieval areas, fantasy settlements, ancient frozen citadels, and many European city centres up to the present day! MODERN: For those gaming in the modern or futuristic era, we've designed a theme where the road surface is asphalt, the open areas are paved with large geometric stones, there are proper pedestrian sidewalks which protrude 1mm from road level and are 2.5cm (1") wide. There are drainage facilities, such as manhole covers. Road lines are possible but may limit the option of playing in different Scales. Wider road widths may be made available via stretch goals during the campaign. Each Urban Battlefields Set is comprised of a number of tiles in one of four (4) basic designs. These can be connected and arranged to create any layout you can think of. Apart from these Reward Set designs, more were made available through unlocking Stretch Goals.